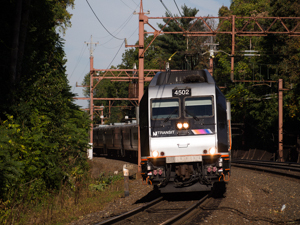 It started with an all-too-familiar incident: an NJ Transit train had become stuck; one passenger reported the train had just entered the trans-Hudson tunnel when there was a bump, a flash, and the train suddenly stopped. The train, reportedly #3850 from Trenton due into New York at 3:15 p.m. on Friday, April 14, remained motionless in the Hudson River tunnel and did not reach Penn Station until about 6 p.m. Aboard the train, with no power to provide fresh air, riders became increasingy concerned; reportedly one passenger fainted, and another broke out an emergency window. Riders complained that there was a lack of information: first they were told the train would be towed, then that they would be evacuated. Finally, the train sat as Amtrak had to inspect it before it could move. But as it turned out, the stuck riders were the lucky ones. At Penn Station, delays multiplied as trains were rerouted around the stuck train; delays increased to an hour or so through the evening rush hour. The station became crowded as thousands of riders waited for their delayed trains. Riders seeking the Midtown Direct trains to the Morris & Essex and Montclair-Boonton lines of NJ Transit were directed to Hoboken; they headed for PATH trains and ferries in the hope of getting home somehow. They too were lucky. In the crowded station, an individual became unruly and Amtrak police used a Taser to subdue him; he protested, "I'm not resisting. This is only my mouth. I have freedom of speech." (Some reports say that the person subdued by the police was a passenger on the train that had been stuck.) Perhaps due to the noise of the Taser, and with everyone on the alert due to well-publicized terrorist attacks worldwide, the word spread: there was a shooter; shots had been fired. Multiple calls to 911 brought a heavy response from New York City police and National Guard personnel. No shots had been fired; there was no terrorist. But the crowd panicked, running for station exits, stumbling, falling, leaving possessions behind. Some recorded the panic on their cell phones, providing ample fodder for evening newscasts. These showed people running and stumbling through the station corridors, notably along the upper-level corrdidor that leads to the exit at 7th Avenue and 32nd Street. And on the NJ Transit 7th Avenue concourse, ropes and posts that had guided riders to the ticket windows lay on the ground, testimony to the flood of humanity that had apparently trampled them. One report said 16 people were injured in the stampede. Mayor de Blasio tweeted that "no shots were fired" and that Fire Department paramedics were treating the injured. By 10 p.m. NJ Transit was still announcing delays of up to two hours as the system struggled to get back to normal. Out on the Gladstone branch, where the last train should arrive around 1:30 a.m., a westbound train was heard passing over an hour later, suggesting that delays continue until the close of business at NJ Transit.